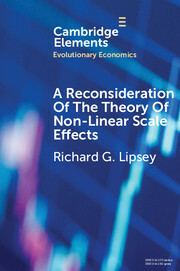 Evolutionary economics is based on the idea that economic phenomena and the behavior of economic agents are best understood from the perspective of evolutionary science. Evolutionary economics is broadly concerned with questions of dynamics and change, with a particular focus on processes of entrepreneurship and innovation, industrial and institutional dynamics, and on patterns of economic growth and development. Elements within the series are fast tracked after formal acceptance, updatable, accompanied by the latest functionality by being hosted on Cambridge's new institutional platform (Core), as well as being available via low-priced POD. They will appeal to researchers and graduate students wanting scholarly overviews of theoretical and analytical building blocks of evolutionary economics, and also to stay abreast of current methodology or learn new tools. Cambridge Elements in Evolutionary Economics are intended to be able to be pieced together to provide comprehensive course texts.